One of our most beautiful filigree floral designs from our vintage-style collection. 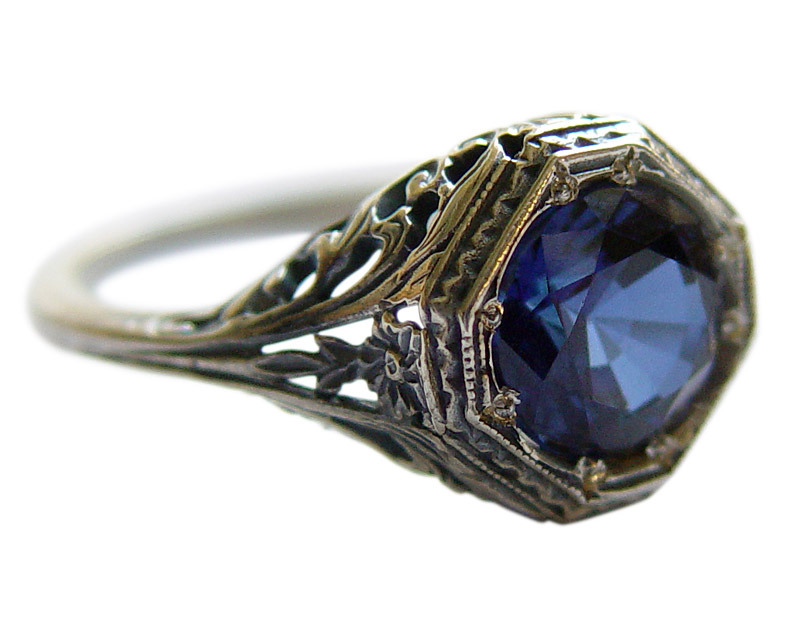 The ornate, floral and leaf band is set with a large 8mm simulated blue sapphire (cubic zirconia) in an octagonal shaped setting with antique-style prongs. What makes this vintage design ring from Apples of Gold so unique is that it is not an artistic rendition from our designer's imagination, but actually made using the original circa 1800s jewelry hubs and tools from the era to recreate the original ring's design as a brand new jewelry piece. In other words, these are authentic, exact reproductions from rings that were available on the market during the time period. Also available in white or yellow gold by request. We guarantee our Vintage Octagonal Floral Blue Sapphire CZ Ring in Sterling Silver to be high quality, authentic jewelry, as described above.